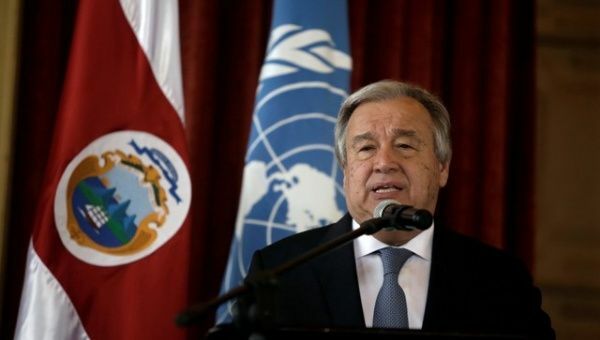 August 7 (teleSUR) UN Secretary-General Antonio Guterres has condemned Saturday’s drone attack, which targetted Venezuelan President Nicolas Maduro. “The secretary-general is concerned about the latest developments in Venezuela and rejects any act of violence,” said Farhan Haq, Guterres’ deputy spokesman. The drone attack occurred at an outdoor event Saturday when Maduro was making a speech to national guard troops. Seven troops were injured, and Maduro was unhurt. Haq said: “We would encourage neighboring countries to work cooperatively with each other,” responding to Colombia’s alleged involvement in the attack. Venezuela’s interior minister Nestor Reverol announced Sunday that six persons had been arrested in the case of drones loaded with explosives that were used as part of an attack against Maduro. Reverol said in a televised statement one of the “terrorists,” who participated in the attack on Maduro, also participated in an attack on a military base in the central city of Valencia in 2017, while another was part of violent anti-government protests in 2014. He also indicated that the police confiscated several vehicles and film evidence for the failed attempt against Maduro. The attack against Maduro took place at the 81st anniversary of the Bolivarian National Guard, in which two drones carrying explosives were detonated near the presidential platform, injuring seven military personnel and halting Maduro mid-speech.